Marks-Tey Share The Moment is a 6 year old red Doberman from the Marks-Tey Kennels in North Carolina. She was donated to Pilot Dogs, Inc. of Columbus, Ohio, to be trained as a guide dog. When she's not working, Share's hobbies include singing, and mock-stalking and chasing the family cats. 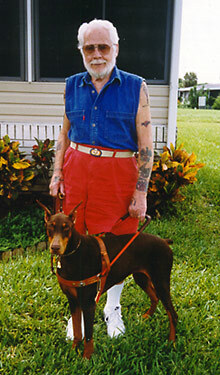 Her Dad, Jymm, enjoys the independence and companionship that having a dog like Share provides him. And Share, in lieu of cat, and because she's a real lady, enjoys her peanut butter cookies in bed.